Download The Immortal Life of Henrietta Lacks in Digital HD from the iTunes store. 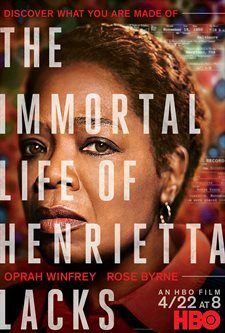 The Immortal Life of Henrietta Lacks images are © HBO. All Rights Reserved. You know that if Oprah Winfrey (The Color Purple) and her production company are going to be involved in a film that it is going to be a drama and generally based on either a book or real life events. In this case, The Immortal Life of Henrietta Lacks is both. Winfrey rarely gets involved in a project unless it has something to say and this one is no different. Based on the 2010 NY Times bestselling book, the film is a personal look at the author's journey with Henrietta's family. In 1951, Henrietta Lacks was diagnosed with cervical cancer after she felt a knot in her womb. Originally thought to be from pregnancy (which she was at the time), it was only after hemorrhaging during childbirth that the knot was biopsied and determined to be cancerous. During one of her visits to Johns Hopkins Medical Center, samples of Henrietta's cells were taken without her knowledge or consent (which is typical) and were determined to be fast growing and useful. While Henrietta died later that same year, her children and husband were still alive and, unknown to them, her (HeLa) cells were being used in all kinds of medical experiments. It wasn't until 20 years later that they first heard about the cells and that they had been utilized in all manner of medical research including the development of the Polio Vaccine. In the mid-2000's author Rebecca Skloot (Rose Byrne; Bridesmaids) made contact with the Lacks family, determined to write a book about Henrietta and the cells. Initially reluctant, the family eventually granted her more access than they had anyone else previously and she wrote the book not only about Henrietta, her illness, and the cells but also about the Lacks family, their struggles and the time Skloot spent with them, especially Henrietta's daughter, Deborah (Winfrey). Having read the book, I knew the story already and was interested to see how they made it into the film. While it is a touching story about one person's contribution to science, her family and the connection to the mother some of them don't even remember, and the author who helped them honor her, it is missing so much of what made the book great. Understanding that a book of that length would have been a four-hour movie, screenwriter and Director George C. Wolfe (Nights in Rodanthe) only vaguely touched on Henrietta and her illness and focused more on Deborah, the family and their struggles. Byrne is terrific as Skloot, a somewhat naïve freelance writer determined to get the Lacks family to trust her enough to tell their story. If it helps any, she bears a resemblance to the real Rebecca Skloot, which is a nice touch, and her range of emotion in the film is well done. However, the stand out is Winfrey herself as the emotionally, mentally and physically ill Deborah. Watching her go from manic to depressive in the course of a minute is incredible to watch and she seems to capture all the many sides of Henrietta's daughter. The digital download is well done with a color palette ranging across the spectrum. The audio is also good but the mix was sometimes off and I had to adjust the volume at times to hear the softer spoken words. This was unusual for a non-action movie but it only seems to happen periodically. It's an interesting and well-done film but knowing there is so much more to the story, I felt the film could have been longer. The scientific portions of the book were barely touched and much was glossed over but for anyone who hasn't read the book, I do recommend watching this to become aware of HeLa, the medical field, and Henrietta Lacks' family.